It has been suggested that this article be merged into Lists of legendary creatures. (Discuss) Proposed since December 2018. 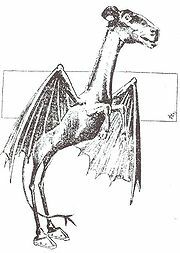 This is a list of cryptids, which are animals presumed by followers of the cryptozoology pseudoscientific subculture to exist on the basis of anecdotal or other evidence considered insufficient by mainstream science. While biologists regularly identify new species following established scientific methodology, cryptozoologists focus on entities mentioned in the folklore record and rumour. Entities that may be considered cryptids by cryptozoologists include Bigfoot, the chupacabra, or Mokele-mbembe. Related pseudosciences include Young Earth creationism, ghost hunting, and ufology. Some dictionaries and encyclopedias define the term "cryptid" as an animal whose existence is unsubstantiated. ^ Card, Jeb J. (2016), "Steampunk Inquiry: A Comparative Vivisection of Discovery Pseudoscience", in Card, Jeb J.; Anderson, David S. (eds. ), Lost City, Found Pyramid: Understanding Alternative Archaeologies and Pseudoscientific Practices, University of Alabama Press, p. 32., ISBN 9780817319113, Creationists have embraced cryptozoology and some cryptozoological expeditions are funded by and conducted by creationists hoping to disprove evolution. ^ "Cryptid". The Oxford Dictionary. Retrieved 17 June 2016. ^ "Sasquatch". Canadian Encyclopedia. Retrieved 17 June 2016. ^ a b c d e f g h i j k l m n o p q r "The world's greatest imaginary animals". Salon. Retrieved 12 December 2018. ^ "Australia's terrifying cryptid of the swamp". Retrieved 12 December 2018. ^ "Loch Ness monster: Why we can't let science kill mystery". The Daily O. Retrieved 18 December 2018. ^ a b Loxton and Prothero (2015:261-295). ^ "The Canvey Island Monster was a cryptid". The Canvey Community Archive. Retrieved 18 December 2018. ^ a b c Michael Shermer" Pat Linse (November 2002). The Skeptic Encyclopedia of Pseudoscience, Volume 1. ABC-CLIO. p. 72. ISBN 9781576076538. ^ "10 mysterious monsters of Africa". Afrikanza. Retrieved 18 December 2018. ^ "Ireland's hound of deep - Dobhar Chu". Irish Central News. Retrieved 19 December 2018. ^ a b c d "Cryptozoology: What else is out there?". TNT magazine. Retrieved 12 December 2018. ^ "Is this Iceland's Loch Ness monster? Lagarfljot river worm caught on film". The Independent. Retrieved 12 December 2018. ^ a b S.J. Velasquez (31 October 2015). "The monster you should never find". BBC Online. British Broadcasting Corporation. Retrieved 11 August 2018. ^ Loxton and Prothero (2015:228-326). ^ Nickell, Joe (Winter 2016–2017). "Steller's Sea Ape: Identifying an Eighteenth-Century Cryptid". Skeptical Briefs. Vol. 26 no. 4. Committee for Skeptical Inquiry. ^ Fortean Times. John Brown Pub. 1997. p. 43. ^ a b c "Fantastic Cryptids And Where To Find Them". Forbes. Retrieved 18 December 2018. ^ Loxton and Prothero (2015:29–70). ^ "On the hunt for the elusive Bukit Timah Monkey Man". Channel NewsAsia. Retrieved 18 December 2018. ^ O'Carroll, Eoin (28 September 2018). "Bigfoot and beyond: Why tales of wild men endure". The Christian Science Monitor. Retrieved 11 December 2018. ^ Brian Regal (15 October 2009). Pseudoscience: A Critical Encyclopedia: A Critical Encyclopedia. ABC-CLIO. ISBN 978-0-313-35508-0. ^ "Maybe Bigfoot believers aren't crazy after all". New York Post. Retrieved 18 December 2018. ^ Press, Clayton. "Oliver Laric Celebrates the Year Of The Dog At Metro Pictures". Forbes. Retrieved 28 June 2018. ^ a b Caleb W. Lack, PhD; Jacques Rousseau, MA (8 March 2016). Critical Thinking, Science, and Pseudoscience: Why We Can't Trust Our Brains. Springer Publishing Company. p. 170. ISBN 978-0-8261-9426-8. ^ "It's the monstrous new trend sweeping travel – what is cryptid-tourism?". Irish Examiner. Retrieved 13 December 2018. ^ Loxton and Prothero (2015:73–117). ^ Caleb W. Lack, PhD; Jacques Rousseau, MA (8 March 2016). Critical Thinking, Science, and Pseudoscience: Why We Can't Trust Our Brains. Springer Publishing Company. p. 154. ISBN 978-0-8261-9426-8. ^ "First sighting of the Mothman". Wvcommerce.org. 12 November 1966. Retrieved 19 September 2016. ^ "The mythic child-stealing Thunderbirds of Illinois". Atlas Obscura. Retrieved 11 December 2018. Look up cryptid in Wiktionary, the free dictionary. Wikimedia Commons has media related to Cryptozoology.